The B-25 Nozzles are of two piece construction with large tangential metering slots in the internal Disc to give a nonrestricted flow with a uniform “Solid” distribution. These Nozzles with high fl ow rates and coarser sprays are used in gas scrubbing, adsorption towers, brine spraying, window and door testing and chemical and industrial processing. 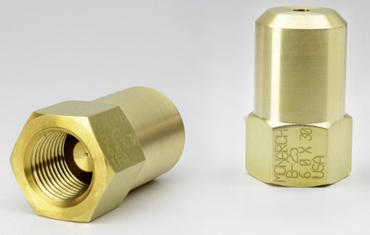 Brass is standard with 1/2" NPT. Also available in any machinable material on request. AAMA APPROVED WATER TEST KIT. SIMULATES HURRICANE CONDITIONS AT 70 MPH! 3 PK - AAMA WATER NOZZLE ONLY - 6.030 X 1/2" (f)NPT - SAVINGS $126.00 TOTAL! 6 EACH OF AAMA WATER NOZZLE ONLY - 6.030 X 1/2" (f)NPT - SAVE $144.00!